The king of the superultramegatechnothriller returns with a 2,000,000-copy first printing, though Clancy’s labyrinthine new behemoth of demonic perils arrived too late for a full review. John Clark, the ex-Navy SEAL and master of secret operational missions from several earlier Clancy novels, including 1993’s Without Remorse, is now Rainbow Six and mastering CIA strike teams out to fight terrorists around the world. At first, an incident at a Swiss bank, the kidnaping of an international trader in Germany, and a ghastly raid on an amusement park don’t seem related. 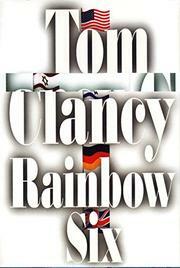 But the charged clouds of good and evil build toward a typically foreshadowed and explosive Clancy finish. Namely, a supremely powerful biotech company is led by a bonkers (yet well-spoken) environmentalist with the vision for a Project even more luminously insane than any frothy megaloid plot hatched by James Bond’s archenemy SPECTRE: a murderous ecoproject that may get underway during the Olympic games in Sydney, Australia, and involve the destruction of almost all human life, merely to insure the survival and greater safety of Nature itself. No disappointments here, but an unusually sumptuous cut of steak can’t hide the familiarity of the menu. by Anthony H. Baltimore, Sr.